Sanjaya said, "Then, O king, the mighty-armed Satyaki invincible in battle, drawing in that conflict an excellent bow capable of bearing a great strain shot innumerable winged arrows resembling snakes of virulent poison, displaying his wonderful lightness of hand. And while slaying his foes in battle, so quickly did he draw the bow, take out his arrows, fix them on the bowstring, and letting them off throw them among the foe, that he then seemed to be a mass of clouds pouring a thick shower of rain. Beholding him then thus blazing up (like a swelling fire), king Duryodhana, O Bharata, despatched ten thousand cars against him. But that great bowman, Satyaki, of prowess incapable of being baffled and possessed of great energy, slew with his celestial weapons all those mighty car-warriors. Having achieved, bow in hand, that fierce feat, that hero then approached Bhurisravas in battle. And Bhurisravas also, that enhancer of the fame of the Kurus, beholding the Dhartarashtra ranks thus felled by Yuyudhana, rushed in wrath against the latter. 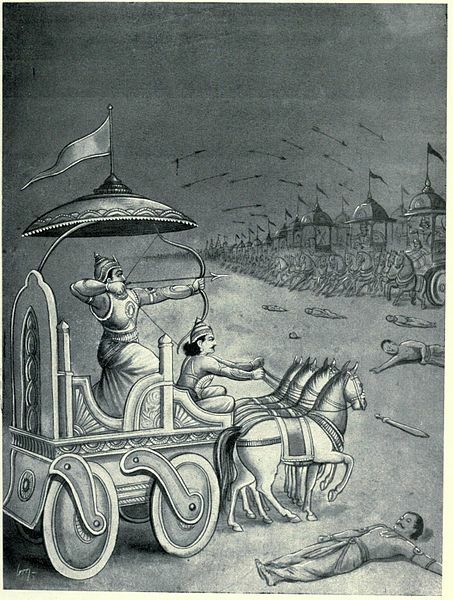 Drawing his great bow which resembled that of Indra himself in hue, he shot thousands of shafts, O monarch, looking like snakes of virulent poison and possessed of the strength of the thunder, displaying his extreme lightness of hand. Thereupon the combatants that followed Satyaki, unable to bear those shafts of fatal touch, fled away, O king, in all directions, abandoning, O monarch, the invincible Satyaki in that conflict. Thus addressed by them, that mighty hero endued with great strength and proud of his prowess, that foremost of men, beholding them before him, replied unto them, saying, 'Ye heroes, ye have said well. If such be now your wish, fight ye then all together with care. I shall slay all of you in battle.' Thus addressed by him, those heroic and mighty bowmen endued with great activity covered that chastiser of foes with a thick shower of arrows. And it was towards the afternoon, O king, that that dreadful battle took place between Bhurisravas alone on one side and the many united together on the other. And those ten heroes covered that single mighty car-warrior with showers of arrows like the clouds showering rain on a mountain cliff in the season of rains. That mighty car-warrior, however, cut off, those clouds of shafts shot by them resembling the fatal darts of Death or the very thunder in effulgence, before they could reach him. They then, surrounding that mighty-armed warrior, endeavoured to slay him. But the son of Somadatta, excited with rage, cut off their bows, O Bharata, and then their heads, with sharp shafts. Thus slain, they fell down, O monarch, like mighty trees felled by the thunder. Beholding then his mighty sons thus slain in battle, the Vrishni hero (Satyaki), O king, uttering a loud roar, rushed against Bhurisravas. And those mighty warriors then each pressed his car against the other. And each of them in that combat slew the other's car-steeds. And both deprived of their cars, those mighty warriors jumped down on the ground. And both taking up large scimitars and excellent shields encountered each other. And those tigers among men, stationed for the encounter, shone brightly. Then Bhimasena, O king, quickly coming up to Satyaki thus armed with an excellent scimitar, took him up on his own car. And thy son also, O monarch, speedily took up Bhurisravas on his car, in that battle, at the very sight of all the bowmen. 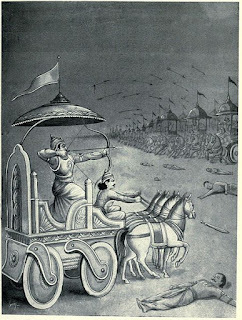 "Meanwhile, during the continuance of that battle, the Pandavas, O bull of Bharata's race, excited with wrath, fought with that mighty car-warrior Bhishma. And when the sun assumed a red hue, Dhananjaya exerting himself actively, slew five and twenty thousand great car-warriors. These, urged on by Duryodhana for slaying Partha, were thus completely destroyed before they could even come up to him, like insects on a blazing fire. Then the Matsyas and the Kekayas, all accomplished in the science of arms, surrounded that mighty car-warrior Partha as also his son (for supporting them). Just at that time the sun disappeared, and all the combatants seemed to be deprived of their senses. Then at twilight, O king, thy sire Devavrata, his animals having been tired, caused the troops to be withdrawn. And the troops of both the Pandavas and the Kurus, filled with fear and anxiety in course of that dreadful encounter, proceeded to their respective camps, the Pandavas with the Srinjayas and the Kauravas also rested for the night agreeably to the rules (of military science)." 400. 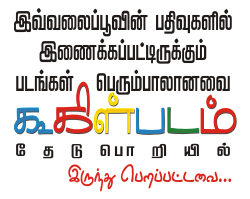 The pronoun 'sa' in the first line of 8 refers to Yuyudhana. Burdwan Pundits erroneously take it as referring to Duryodhana, being misled by the words Kurunam Kirtivardhanas. 401. The Bombay reading asaniparabhan (which I adopt) is better than the Bengal reading asaniswanan, for in connection with yamadanda immediately preceding the latter would be incongruous, if not unmeaning. 402. An additional verse occurs here in connection with the slaughter of Satyaki's sons, in the Bombay texts. The Bengal texts omit it.